Will kids like my game? “Will people like my game?” is a hard question for user researchers. This is doubly so when asking “Will children like my game?” In this article I look at why this is the case, and what games user researchers can do about it. Game developers are often interested in whether people like their games, for obvious reasons. Enjoyment is the ultimate goal for games, and seems like it would have a strong correlation to review scores and sales, which makes it an important measure for success. Therefore knowing whether people will like your game before it’s finished, and what aspects of the game people like most, would be helpful for developers to help them improve the games overall quality. This becomes increasingly important for kids games, as the developers can have limited insight into what children like. There is some difference between a developer and an adult player, however the gap between a developer and a child player is much bigger, and so enjoyment is more difficult for them to predict. There are however a number of complications that make it difficult for user researchers to answer enjoyment questions. With usability issues, Jakob Nielsen’s famous research has shown that testing with only 5 users will identify 80% of usability issues. However with questions about enjoyment, development teams are often after a % score, which they believe could correlate to their metacritic score. This requires a quantitative study, which needs a lot more users to be statistically significant. Testing with more users requires more the time for running the test, and for analysis, and hence costs more. With kids, there are more challenges. Primarily it is more difficult for children to critically evaluate games, for a number of reasons. From my experience, they are often rating the experience of “coming in to play games”, rather than the game itself, and so will rate everything highly, regardless of their opinion of this specific game. Kids also have had less experience of games in general, and so can lack points of reference to compare this game too. This can make data such as rating scales or agreement scales meaningless. Depending on their age, children often don’t pay for the games they are playing. This makes questions around “would you buy this game” meaningless, since they do not have the experience with money to be able to make this decision. In effect the question then becomes “would you want to be given this game (for free)?” to which anyone would answer yes, regardless of the quality of the game. Although a lot of best practises exist for usability testing with kids, I have yet to see anything about how to get reliable ‘enjoyment’ answers from children. However other fields have had a lot more experience with working with children, so there may be benefit in learning from other forms of kids’ entertainment. Kathleen Kremer gave a presentation at CHI2012’s Games User Research Workshop about their methods at Fisher Price, and mentioned that they have an informal test for engagement. In their lab, they have a clock that looks like a monkey. They keep track of how often children are looking at the toy versus how long they spend looking at this clock. Although only informally applied here, comparisons with alternate activities could be an avenue worth pursuing to evaluate enjoyment for kids. I don’t know how it works in TV, though I imagine they must have a way of evaluating whether kids like a show prior to producing a full series. 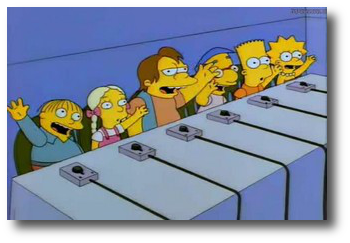 On the Simpsons they show the kids being invited to a focus group to give their opinions on the future direction of Itchy and Scratchy (“one kid seems to love the Speedo man!”). However as shown in the episode focus groups have too many doubts about their validity to be useful for scientific studies, especially when working with children, so are unlikely to be useful for games development. So, there’s no obvious answer for how to discover if kids like a game. I’d be interested in hearing your thoughts on this, and whether there are any best practises from other fields that could be relevant here. Please feel free to leave comments below! Is my social game good?